<span title="This description doesn't match the data item. Please make them the same and remove any wiki markup. Data item description = “The turning direction of a one-lane road, based on road markings, signs, or signals. Use turn:lanes if the turn indications differ from one lane to another, turn:forward and turn:backward on a two-way road, etc.”">The key turn can be used to specify the direction in which a way or a lane will lead. to the junction or the completion of merge. This key is mostly used with the :lanes suffix (turn:lanes=*), to tag indicated turn markings for individual lanes. See the section Turning indications per lane on this page. At intersections where turn=* and turn:lanes=* keys are used, legal turning restrictions are expected to be correctly specified to allow navigation programs to calculate driver lane assistance properly. These turning restrictions are explained in the restriction relation article. Without a ":forward" or ":backward" or ":both_ways" direction suffix, the turn=* applies to both directions, or to the forward direction of oneway=yes highways (the same direction as the OSM way is drawn), or the backward direction of oneway=-1 highways (the reverse direction as the OSM way is drawn). You usually don't need to append such direction suffix to most oneway highways, unless the other direction applies to specific vehicles allowed to use the highway in the opposite direction (e.g. for some bus service lanes or cycleways, possibly on the same shared single lane, usually with a priority or with trafic control devices to alternate the direction when needed for these vehicles, or with special warning signals). In most frequent cases these tags are used to specify turn directions for separate lanes, but on bidirectional highways with separate single lane per direction, you can just separate the forward and backward directions. If you use the ":lanes" suffix, the number of values specified separated by vertical lines (|) must match the number of lanes according to their direction. In addition to the individual values listed below, you may also indicate multiple directions by separating them in any order with a semicolon (;). 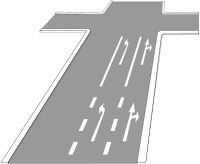 If you specify multiple values any one of separate lanes, the lanes order must be preserved and must still be separated by vertical lines (so a lanes tag whose value is given as turn:lanes=a1;a2|b1;b2 specifies values for two lanes, not three, each lane having two values, and is equivalent to turn:lanes=a2;a1|b2;b1 but not to turn:lanes=a1;b2;a2|b1). This value could be skipped for a shorter format, so ||right is equivalent to none|none|right. Some people find the latter more readable. Usually the turning indications of a road differ from lane to lane. To specify those indications for every lane, the :lanes suffix is used. For details about the :lanes suffix in general, see Lanes. View the road in the direction of the osm-way. If you want to describe only the lanes of one direction of the road, use either turn:lanes:forward=* or turn:lanes:backward=*. The key turn:lanes:forward=* describes only the turning indications on the lanes in the same direction as the osm-way. The key turn:lanes:backward=* describes only the turning indications on the lanes in the opposite direction as the osm-way; doing so view the road in the opposite direction of the osm-way for this. There are three lanes on a one-way, and the leftmost lane will turn left, the rightmost lane will turn right and the lane in the middle will go straight through the next junction. There are two lanes on the road in each direction. Those lanes running in the same direction as the osm-way are considered to be "forward"; the others "backward". The left lane of the forward direction will turn left and the right lane will go straight through and also turns right. The left lane of the backward direction will go straight through, the right lane will turn right and also continue straight through. The following example shows a motorway with two links. Bryan Housel has stated they are adding a visual turn lane editor to iD during July-August 2016. This will likely make it into iD v3.0, which should be released before 2020. Lanes for the description of the :lanes suffix. Forward & backward, left & right for describing the direction of the highway and how to determine this in the Potlatch 2 editor. destination:lanes=* for describing the name of the city the street is heading to. OsmAnd supports turn:lanes to show lane recommendations in navigation mode.